The 29m Dubois sloop, Margaret Ann, has just completed a refit at Pendennis and is now back in the water. Initially built at Pendennis in 2004, Margaret Ann has classic Dubois features such as the pilot house with raised seating area, and careful placement of running gear as to provide an uncluttered foredeck area. 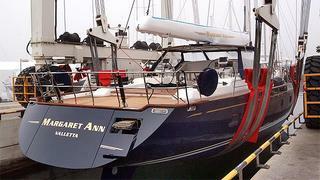 In late 2012 the owner was keen to bring the vessel back to her original builder for a refit. Her four-month programme of works included the installation of a new cutlass bearing and re-alignment of drive train; rejuvenation of the teak decking; paint works; new anchor chains and a generator rebuild. Margaret Ann’s refit was closely managed by Pendennis and the Captain, with a blend of trusted local subcontractors used alongside Pendennis’ in-house engineering experts. Pendennis Palma also has a strong relationship with local joinery company Trappmann Interiors, who carried out all joinery works aboard Margaret Ann, with Pendennis able to provide all the original build information to assist with the smooth running of the refit. The yacht was re-launched end of January 2013 and will spend the rest of the summer charter season around the Mediterranean.